The Liver and Gall Bladder are the organs associated with the Wood element. Horses do not have a gall bladder to store bile but they do produce the bile needed to digest fats. The liver has many functions but one of the most important is neutralizing toxins. The Wood horse does best on an easily digested, clean, simple diet. Poor quality oil, synthetic vitamins and multiple herbs are 3 problem supplements for the Wood horse. Vegetable Oils, such as corn oil, are high in calories, hard to digest and full of omega 6 fatty acids. The horse is not equipped with a gall bladder to allow large amounts of bile to be available for digesting a high fat meal. Wood horses can be especially affected by too much fat if their liver is not producing adequate bile. Quality fats such as chia seeds, rice bran, flax or coconut oil are much better choices of fat for the Wood horse. Even good fats should be fed sparingly to the Wood horse. 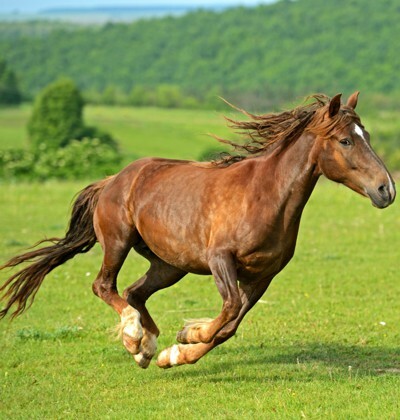 Wood horses do not do well with large amounts of Synthetic Vitamins. Wood horses may handle the vitamin premixes in a feed but they should not be given formulated vitamin supplements. All horses do best with food source vitamins and AFA blue green algae is a really good choice of whole food nutrition for the Wood horse. The Wood horse does not do well with supplements containing Multiple Herbs. Several herbs, such as milk thistle and dandelion are wonderful for liver support but some herbal products contain 10 or more herbs and the liver has to process the chemical components of herbs that are not needed. Multiple herbs can also dilute the beneficial effects of helpful herbs. If you are feeding herbal supplements to your Wood horse make sure that the supplement is needed and having a positive effect.